The cave of Tuc Audoubert was discovered by the three sons of Count Henri three Bégouën on 20 July and 10 October 1912. 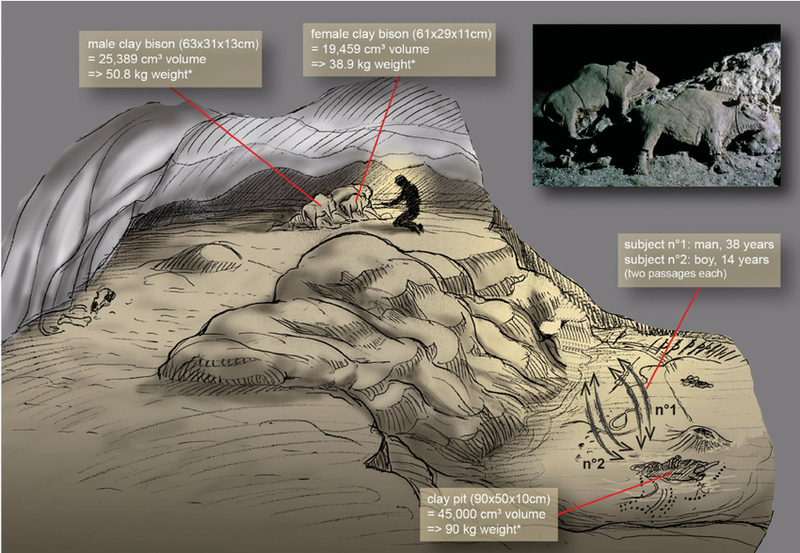 Modeled out of clay from the walls of the cave, the bisons stand next to each, propped up against a small boulder in the darkness. Although they stand at a diminutive 18 inches tall by 24 inches long, their craftsmanship and durability is remarkable. Until they were discovered in the early 20th century, the bison stood alone in the damp French cave for thousands of years. The marks of the artist's hand and the tools used to draw the details of the face and mane are still clearly visible. Objects such as these clearly show that man was using clay for artistic expression long before the actual firing of clay was discovered. The walls of these caves also are covered with drawings of bison and other game animals, marked in carbon from the fires, as well as the earth minerals such as iron oxide and manganese, showing that these ceramic coloring materials that we still use today were known to our earliest ancestors. The bisons' shaggy mane and beard appear to be carved with a tool, but the jaws are traced by the sculptor's fingernail. The impression given is one of immense naturalistic beauty. The female bison is ready to mate, while the Bull is sniffing the air. 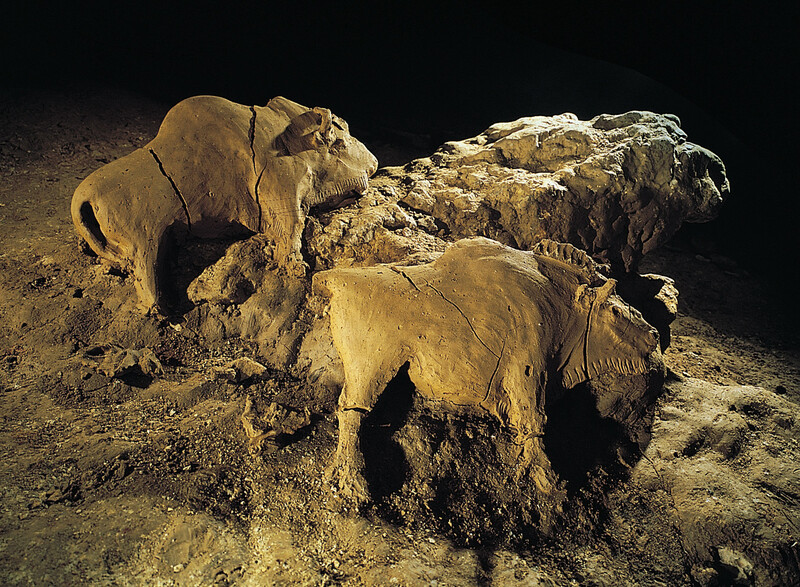 Both animals are supported by a central rock, and are unbelievably well preserved (proving perhaps that there was never a passage connecting the Tuc d'Audoubert cave with the Trois Freres), although they have suffered some drying out, which has caused some cracks to appear across their bodies. Also in the chamber are two other bison figures, both engraved on the ground. Prehistorians have theorized that the a small group of people (including a child) remained in the Tuc d'Audoubert cave with the sole reason of participating in certain ceremonies associated with the cave art. 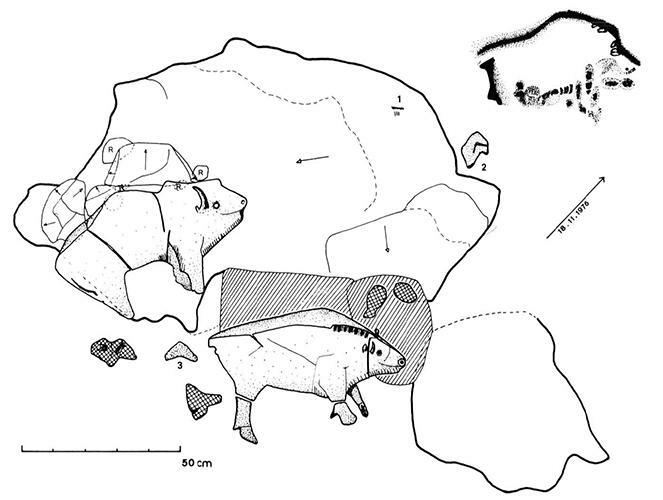 The remote location of the clay bison - beneath a low ceiling at the very end of the upper gallery, roughly 650 metres from the entrance, is consistent with their involvement in some type of ritualistic or shamanistic process.